Abang Mercy was born in Ogoja in 1984, in a neighbouring town to Boki located in Cross river state. She studied at Holy Child Primary School and later proceeded to Holy Child Secondary School, both in Igoli- Ogoja. Abang Mercy relocated to Abuja with her parents where she continued her secondary school education at Gwarinpa Secondary School, Federal Capital Territory, Abuja. She also attended the International Institute of Journalism where she studied Journalism. She obtained a Post-Graduate certificate in Advertising and Public Relations. Mrs Mercy studied Digital Story Telling at the Grimme-Institut in Bonn, Germany. She has also studied Media in Peace Keeping Operations and Elections Observation at the Kofi Annan International Peace Keeping Training Center in Accra, Ghana. 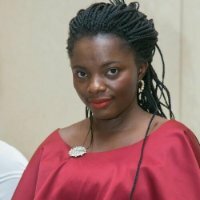 Abang Mercy is a Nigerian journalist, Environmental consultant and Social media expert. She has gone on several election observation missions on the West African sub-continent. She also runs an interview series, “Conversations with Abang Mercy”. She has worked at Independent Television and Radio, Abuja as a Political correspondent. At ITV Abuja, she worked as a non-linear editor, Presentation director and Producer. One of her programs was a breakfast show, This Morning on ITV. In the course of her work with Heinrich Boll Foundation, she has done articles and presentations on Nigeria’s environmental situation and postulations for the future in several Nigerian cities including Lagos, Abuja and also internationally, in Berlin and London. She has worked with her fellow African youths and civil societies organisations in lobbying and advocacy with organisations like Oxfam GB Nigeria, West African Civil Society Forum, Heinrich Boell Foundation etc. Mercy worked as a Media assistant to the former Governor of Cross River State, Governor Donald Duke during his presidential campaigns on the platform of the Donald Duke Campaign Organization. In 2004, she represented Nigeria alongside other influential Africans lobbying against the Economic Partnership Agreements (EPA) with the European Union and the African and Caribbean Countries (ACP) in Senegal and the Gambia. In 2014, Mary Abang was a participant of African Union’s Third Annual High Level Dialogue on Democracy, Human Rights and Governance in Africa; Trends, Challenges and Prospects that held at Nairobi’s Safari Park. Mercy Abang played a role during preparations for Nigeria’s 2015 elections. In September 2014, Mercy anchored a Lagos meeting with young people where she interviewed Nigeria’s Former Vice President and a presidential aspirant in the election, Atiku Abubakar. In March 2015, Mercy hosted a 2-hour live television town hall meeting with the Chairman of the Independent National Electoral Commission (INEC), Mr. Attahiru Jega. She was in working company of the international journalist, Kadaria Ahmed of the BBC. She is also a contributor at top media organisations in Nigeria like YNaija and EcoJournalism . YNaija is an internet newspaper for young Nigerians whereas Ecojournalism helps in easy writing of essays. In Mercy Abang’s words, “Challenge is not forgetting who you are and what you stand for”. She explains that switching roles at specific times has been a challenge but she has overcome that by specifically defining her roles at every point in time. Mercy is not biased in her opinions and this has landed her on great platforms. We really do admire the great works she is doing here in Nigeria. We hope our girls and women will learn from her.